As I head into these last couple of months before the exam. It has become a little more difficult to focus. Especially, with the amazing weather that is perfect for going out and enjoying the outdoors. I have kept to my 15 to 30 minutes a day of reading during these last few weeks, but it has been tough on a few occasions. However, I’m still right on schedule for my 5 month plan, so far at least. In September, I worked my way through the So-Matome N1 Reading Comprehension book. I did the So-Matome N2 Reading Comprehension book before and felt like it did a good job of introducing me to the skills needed for N2. However, it didn’t quite finish the job. In particular, it was just a lot easier than the N2. But, that is water under the bridge, the N1 level of the So-Matome Reading Comprehension book is a little more difficult and better written than the N2 level. So-Matome always seems to focus more on phrases and structures than strategy and this book is no exception. A lot of the sections focus on a particular pattern you need to master. But, there are some strategies in it as well. I feel like if you did this book and then rounded it out with a few practice tests or mock tests, you would do all right on the N1 reading section. I’m not saying you’ll be able to ace it, but you should be able to pass that section if that is what you are looking to do. This book follows the pattern that a lot of So-Matome books follow. The book is divided into 6 weeks, and those weeks are subdivided into days. The first 6 days go over skills and phrases that you need and then on day 7 you get some real test questions without any assistance. Each of the first 6 days focuses on one particular topic. Sometimes that is practicing connectors like つまり, いわゆる, and so on. Sometimes that is practicing the skill of ‘stripping’ a sentence (reducing it down to its most basic elements). What is unique about this approach is that a typical day has 4 questions. The first question is usually just a sentence or two and a multiple choice question with 2 possible answers. Then, the passage for the next question is a little longer and there are more possible answers, and so forth and so on. This helps ease you into the point they are trying to make for each day instead of throwing you in head first. And the last question of the day is generally pretty difficult. The exception to this is that the last week is all long form essays to help you with your memo taking skills, which is extremely helpful. The whole last week goes over how to dissect and mark up long form essays so that you can score better on the test. I’ve been putting a lot of these skills to use in my reading, and will definitely be using it on the test. The topics are broken down into easily digestible chunks. This book was designed for people that have a hectic schedule and need to be able to schedule their study time in little bite-sized pieces. I also like how they gradually step you through the process, giving you increasingly longer and more difficult passages to work through. I felt like the long essays toward the back of the book were right at about the same level as the real test and good practice for note-taking/memo-making. I also enjoyed the little essays between the chapters that were there just for fun, as well as the translations of the essay. I felt like this just wasn’t bulky enough to be the only book you use to prepare for the reading section. It has all the information you need, but just not enough practice, so I would recommend going through some mock tests, or even old 一級 tests because the format is very similar, and the essays have similar content. If you get in some extra reading practice, you should be set to take the test and pass the reading section. This is a pretty good book. Especially if you need a step by step approach to learning reading comprehension. It might not be the end-all-be-all, but it will give you the skills you need to pass, maybe just not all the practice. 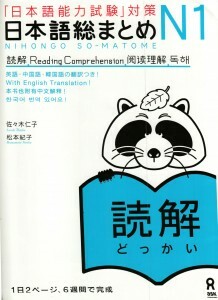 Have you used the So-Matome N1 Reading Comprehension book? How was it? Let me know in the comments. I am almost all the way through this book. I’m also prepping for the N1 this year. It will be my third time taking it so I’m really hoping third time’s the charm. The N1 is definitely tough, I think it takes a least two tries to pass. 🙂 I wish you luck! Let’s get it done this time!